The amount of money you should have saved really depends on your age, salary, and lifestyle you have or want to have. 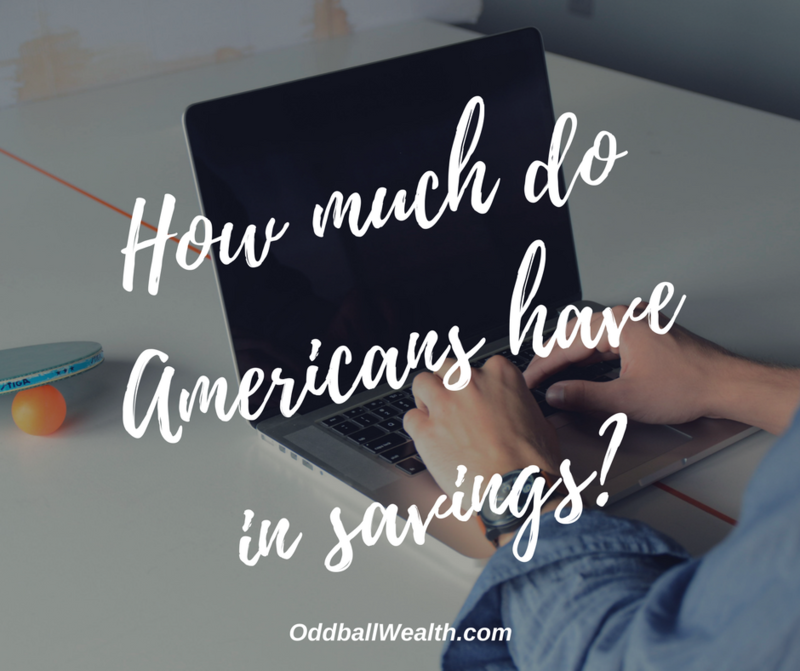 But, to really give you a good idea of how much money you should have saved currently, we’ll go over some facts and statics which will give you an idea of the average amount of money Americans have saved by age groups and the average amount of savings by age that the experts recommend. So let’s get started, how much money should you have saved by age groups? The sad, but unsurprising news is that most Americans have less than $1,000 in savings and about 50 percent of families have absolutely nothing saved for retirement, according to an article by CNBC. According to a 2015 report by the United States Government Accountability Office, around 50 percent of households age 55 and older do NOT have any retirement savings, such as an IRA or 401(k). It also stated that many older households have zero savings (non-retirement savings) in general. For households that do have savings, the average amount saved for households aged 55-64 is only $104,000, and households aged 65-74 the average savings is $148,000. If their savings was converted into an annuity, they would only receive between $310 to $649 every month. We’re often told that we shouldn’t compare ourselves to others, and I believe this to be very true, even when it comes to our money and finances. Since every person has a different standard of living, lifestyle, and financial needs, we really shouldn’t compare our money and financial situation to others. Instead, it should really be based on our own individual personal financial goals, expenses, income, and lifestyle we have or wish to have. I read multiple reports, surveys, and article after article just absorbing all of the information. The data, facts, and statics I found both amazed and stunned me at the same time. Because of this, I decided to compile all of the information and facts, and share some of them with you here. How much should you have saved for retirement by age? As a general rule of thumb, the earlier you want to retire, the more you should be saving. According to Fidelity, to figure out the amount of money you should have saved by certain ages, take the amount of money you think you’ll be making at certain ages (your income will generally increase as you get older) and multiply it by the savings rate. This will give you a good idea of how much money you’ll want to have saved by the time you reach a certain age. By age 30. You should a one full year of your annual salary saved. By age 35. You should have Two-times your annual salary saved. By age 40. You should have Three-times your annual salary saved. By age 45. You should have Four-times your annual salary saved. By age 50. You should have Six-times your annual salary saved. By age 55. You should have Seven-times your annual salary saved. By age 60. You should have Eight-times your annual salary saved. By age 67. You should have Ten-times your annual salary saved. By age 30. Have your annual salary saved. So if you make $45,000 a year, then you should have at least $45,000 saved. According to many financial experts, your final retirement income should be at least 80 percent of your pre-retirement income. For example, if you make an annual salary of $100,000 in your final year of employment, you’ll most likely need a minimum income of $80,000 in retirement to continue to live a comfortable and enjoyable lifestyle. This amount can be calculated using estimated earnings from social security, pensions, investments, savings, and other passive income sources you may have in retirement. One formula you can use to figure out the amount of money you’ll need to have saved to generate your desired retirement income, is to take the amount of income you wish to have in retirement and divide it by 4 percent. This formula assumes you have no additional sources of retirement income (such as social security), that you’ll be living a lifestyle similar to the one you would be living at the time of retirement, and a 5 percent return on investments (ROI) after taxes and inflation. Hi, Tyler! This is a great post! It provides a good start to our people so that they will have an overview how much they should save for their future. Sad to say, a lot of us has no retirement savings even at age 65, and some of the statistics are quite alarming. But people should still not lose hope and be discouraged to save. There are still ways to shovel funds into retirement. The important thing is to start saving. On the other hand, being healthy can also help people stash some more money. The need to pay a hefty amount of medical bills can be avoided. Also, having a reliable coverage in any form of insurance, Medicare, Medigap, employer benefits, etc. are also helpful in making room to save more. Hey Leandro, I’m really glad you liked the post! I agree some of these statics like retirement savings are really alarming. Also, investing in our health and staying healthy is a great way to not only save money (especially long-term, check out this article by Lifehack for more info), but also to live a higher-quality life.